Dreamtime - Commentary Inspired By Bob Dylan's Theme Time Radio Hour: Theme Time Radio Hour Season 3 To Begin in September? Theme Time Radio Hour Season 3 To Begin in September? 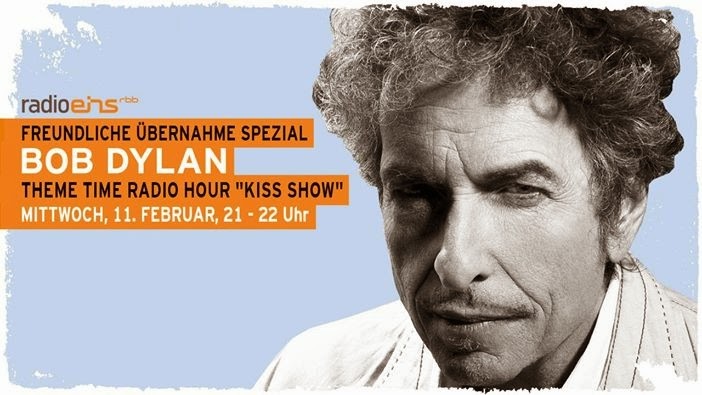 Speaking of the radio show, Dylan wrapped up season two last week, rather abruptly. Perhaps he had to pack to go claim his Pulitzer Prize. XM says he'll be back Sept. 19 with season three - which, if it's like season two, will have 25 new episodes. Season one had 50. The report should probably be taken with a grain or two of salt, as the New York Daily News isn't known as a fount of accuracy, and hence the "?" in my title. September 19, 2008 falls on a Friday, while TTRH has classically aired on Wednesdays, as we all know. Maybe they're switching days, maybe the XM spokesperson got it wrong and meant the 17th, or maybe the Daily News reporter is making it up, and grabbed the September 19th date because it was the date for the start of Season 2. Although it wasn't entirely unexpected, I listened to TTRH on both XMX and Deep Tracks this morning with no little disappointment, harboring the forlorn hope for the last week that Our Host's conclusion at the "Cold" show was a Eddie G./Bob Dylan surrealistic April's Fool Day joke... after all it was made on April 2nd, and what's a day or so between friends? And Mr. D. had said they'd be back with Season 3 "Real Soon," and what could be more "Real Soon" than the following week? But nope, XMX has announced an alphabetic "A" to "Y" countdown of TTRH shows from Seasons 1 and 2 for the next few months, and "Deep Tracks" is apparently re-running the shows from Season 2 in order (note that if they rerun all 25 original shows, the first show of Season 3 would not begin until Wednesday, October 1st). As the Daily News reporter noted, there's a feeling in the TTRH fan community that Season 2 ended "rather abruptly," and there's been some speculation that it may be related to either one or both of the announcements concerning Lee Abrams departure from XM Radio and the DOJ approval of the Sirius buyout of XM. As to the first, while Abrams was certainly instrumental in bringing Dylan to XM, there's no evidence that his leaving would cause Dylan or the TTRH team to suddenly put the show on hiatus. By Abrams own admission in several interviews, he had little involvement or contact with the TTRH team after the original deal was signed and the promotional materials approved. However, it may explain why no credits were aired at the close of the "Cold" episode. Someone may have felt the "For XM Radio, Lee Abrams" credit was inappropriate since he had left the company two days before the show aired, and removed the entire credits sequence rather than edit that specific part out. As illogical as that theory sounds, I've dealt with business manager thinking for over 30 years and can tell you that logic seldom has anything to do with how business decisions are made, especially when it comes to creative work. It's also possible that the proposed Sirius/XM merger might have caused a truncated Season 2. While the FCC public announcement of its decision concerning the merger is overdue, it's possible that the parties involved have received some private indication that the FCC will be looking at the merger favorably. While the merger shouldn't have any impact on XM (or Sirius) current programming, the Sirius CEO has noted in an interview that the merged company plans to offer content currently only available on one station to listeners of both stations. In other words, The Howard Stern Show would appear on XM Radio as well as Sirius, Theme Time Radio Hour would also appear on Sirius, and so on. To do so requires that Sirius/XM renegotiate their contracts with independent content providers such as Gray Water Park Productions/Big Red Tree. That may be a fait accompli, or it may be in process, and may - the theory goes - have caused a shortened TTRH season until the revised contract details are fully worked out. Personally, I think it's unlikely but again,I know from experience that logic can fly out the window when lawyers get involved, all due apologies to Joyride's blood-suckin' partner. Evidence pointing to the claim that the close of Season 2 was unplanned includes the four so-called "missing" shows of Season 2: "Fruit," "Something," "Nothing," and "Streets," announced in an XM Radio press release but never aired, although the other shows listed in the announcement were. It'll be interesting to see whether those shows appear during Season 3. While "Fruit" and "Streets" both sound like probable TTRH themes, I have my suspicions about the other two. I wouldn't be surprised if Eddie Gorodetsky, pressed by XM Radio for p.r. content, threw in "Something" and "Nothing" as a joking nod to Seinfeld. Evidence against the "abrupt end" theory include the facts that Season 2 of TTRH had exactly half - 25 - of the original shows broadcast in Season 1, and that the season ended almost six months to the day after beginning, leading to the conclusion that with the success of Season 1 the Theme Time Radio Hour team negotiated a contract requiring less work, less original material, and fewer broadcasts than Season 1 - perhaps a schedule of six months on and six months off. We'll have to wait for Season 3 to find out.